EDCEH aims to promote Environmental Health, both at level of research and education, in France and in other European countries. 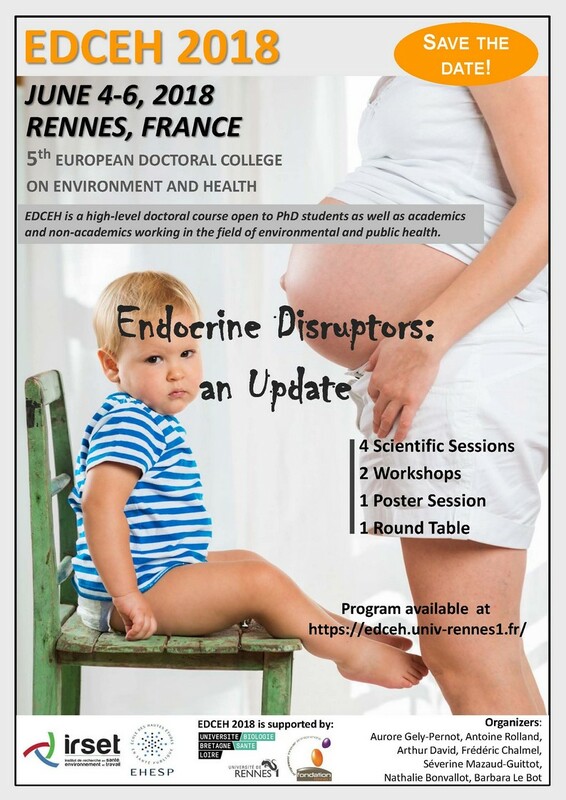 EDECH 2018 offers an attractive scientific program covering important and relevant topics regarding endocrine disruptors. Three scientific sessions, two workshops and one round table on routes of exposure, tolls and new approaches to study endocrines disruptors will be held. EDCEH is open to PhD students and post-doctoral fellows, but also to researchers. This 5th edition will take place from 4 to 6 June 2018 at the Ecole des hautes études en santé publique (EHESP–School of Public Health). EDCEH 2018 is organized by Irset, the Research institute for environmental and occupational health (Inserm UMR 1085). NOTE: Accommodation for PhD students is covered by EDCEH, and travelling expenses will be offered to four PhD students or post-doctoral fellows selected for an oral communication. The Research Institute for Environmental and Occupational Health (Irset) is composed of a multidisciplinary team of investigators, all of whom having a common mission: to research and prevent diseases caused by hazards in outdoor and indoor environments. Hazards under investigation include: chemical and biological agents, present in air, water or food, and interacting with human reproductive, hepatic, immune and pulmonary functions. In addition to its research programs, one major task of Irset is the teaching and training, notably at Doctoral level, of the future experts in the fields of reproductive biology and health, toxicology, exposure assessment, epidemiology as well as public health. Irset is a joint research unit of the French Institute of Medical Research (Inserm), the University of Rennes 1, and the EHESP-School of Public Health, in partnership with the University of Angers, the University of the Antilles, the National Center of Scientific Research (CNRS), and the Rennes, Angers and Pointe-à-Pitre University Hospitals.